Google Maps is introducing a nifty update that makes it a lot easier to book an Uber or Grab right away. 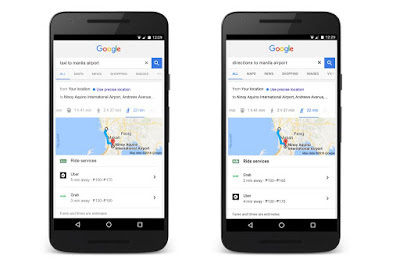 Whether using an iOS or Android device, Google Maps now has a dedicated tab with information for ride services Uber and Grab in addition to car, public transportation, or walking options. So when you are leaving for work or meeting a friend, you can easily compare options to find the fastest way there, without having to open multiple apps. In addition, if you are using Google as your default search engine, you can also pull up the same menu of ride sharing options whether you are using the Google Search app or just your mobile browser. Simply asking for directions to a place, and you will see a tab for ride services complete with fare estimates and pick up times if a car is available near you. If you have voice command installed, you can simply say: “Grab taxi/car/bike to Manila airport” or “Uber to Manila airport.” You can then select the preferred service and it will automatically direct to the ride sharing platform of your choice. Amazing! It's a good news for Uber and Grab's fan like me. Google never let their customer down and they always make best things for our life.